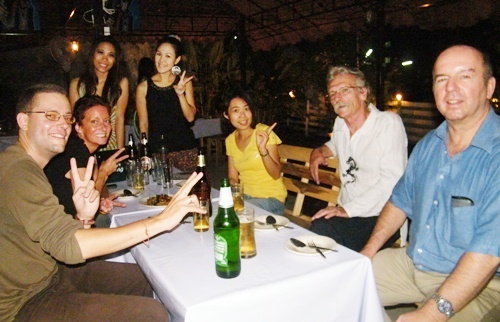 Ajarn Kewarin Sukket, 3rd right, of the Chiang Mai University Language Institute, is accompanied by foreign students studying in the Language and Culture Program for Foreigners held a party at MAD Garden on Suthep Road, Soi 7 on June 12. With them, are Neil Rupe, 2nd right, Bruce Gigson, right, Mike Damoiseau, left, Lynn Anderson, 2nd left. On hand to welcome them, are Pimporn Pitipat, MAD Garden manager, 4th right, and Ann Supatchya, 3rd left, receptionist. A farewell party was held on June 11 at the Empress Hotel for the outgoing Deputy Governor of Chiang Mai, Pairote Saengphuwong, who has been promoted to the post of Acting Governor of Chumporn province in the South. 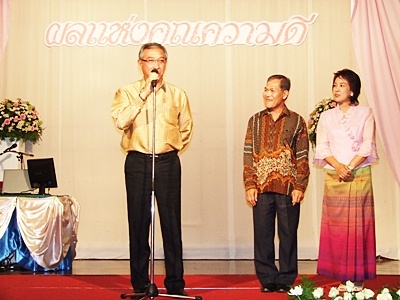 Chiang Mai Governor Amornphan Nimanant, left, said his farewells and wished Pairote, 2nd right and his wife well on their new endeavor. Tesco for Thais Foundation Secretary Saofang Ekaluckrujee (in the green shirt) joined key vendors to present the “Rau Sai Jai Khun” library and sports equipment worth 1.5 million baht to Ban Wang Lao School in Chiang Saen district of Chiang Rai, with Chiang Rai Provincial Clerk Suwat Phromsuwan graciously accepting the donation recently. 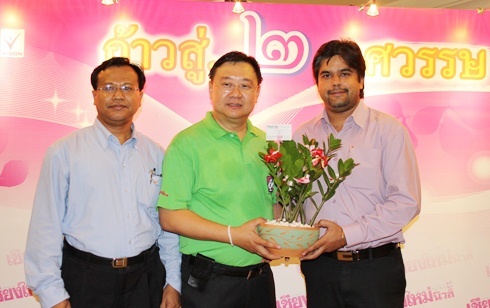 Chiang Mai Mail Managing Director Tony Malhotra (right) and Editor Phitsanu Thepthong (left) presented a holy plant to Sarawut Sae-Tieo on June 15 at the Lotus Pang Suan Kaew Hotel on the occasion of the the 19th anniversary of the daily Thai language newspaper, the Chiang Mai News.